Its Ideal location on the Grand Prix circuit and the hotel's top-floor offers one of the most breathtaking rooftop terraces, with a panoramic restaurant offering a superb venue for viewing. A spectacular streamlined façade with blue glass windows and satin finish stainless steel floor creates a unique atmosphere. 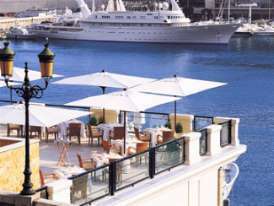 Its 50 boutique suites are furnished to the highest standards of luxury and refinement and overlook the world's most luxurious and expensive yachts, moored in the harbour nearby.